Drive home at dusk or to work in the dawn hours and looking to the sky a cloud of black bodies rush by. What is that? Is it a flashback to a childhood fear of an Alfred Hitchcock movie? Is it a macabre beginning to Halloween and the Day of the Dead? 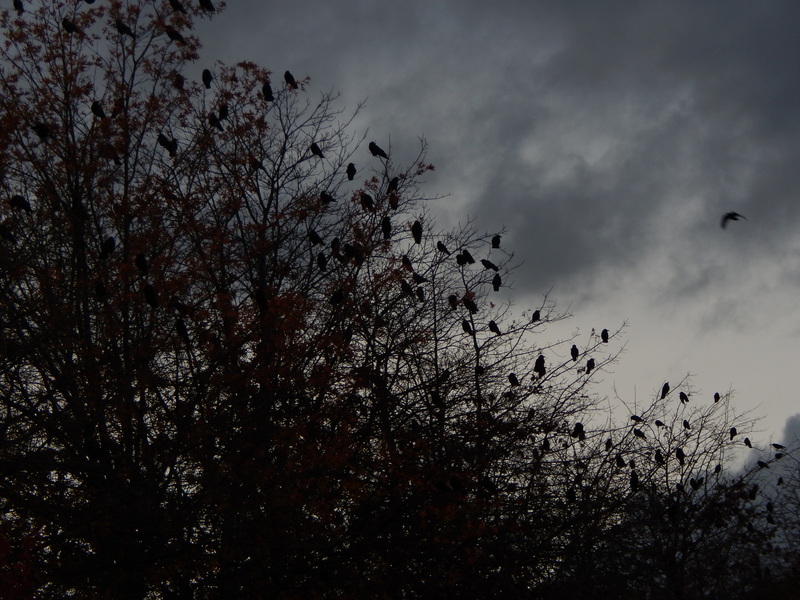 No… this is nature’s crow community annual winter gathering. What you say? Crow’s have community? They consciously party like we humans? They have a strategy to survive winter? Yes is the answer to all of these questions. We as humans are so focused on our own mortality and the unknown that frightens us. That makes us fixate on things in the natural world that we don’t understand. Then we quickly assign our fears and misunderstandings to fill our knowledge gap. Over the years I have documented a huge crow roost that exists south of Renton, Washington in a natural area that borders Springbrook creek. They mob our office building to make for some excellent video. When you watch the video below you can’t help but be amazed. If you want to see the rest of that post here is the link. Next post is apropos for the season. It was exactly a year ago I documented their crazy mob scene down by the fire station north of our office. Here is the link so you can read up on their worship of the sun and a video that lets you hear the volume of cawing that day. Moving on to October of 2013 when I wrote an article about Crow roosts and what University of Cornell’s web site had to say about this behavior. I also started some research with the Renton Museum’s help on why they keep coming back to the same place. (the video and photos in the prior post are in the same area too) Was this a waste dump in the past or was it an agriculture site that they were drawn to for food. This area is just to the east of the now demolished Longacres Racetrack. Did that draw the multitude? I was surprised when my contact at the museum sent me information on the plating of this area. Here is a small excerpt. Want to read more? here is the link. A couple of weeks later I did some more follow-up. This post talks about Hillman and what a crook he was. More important I found information regarding how this area flooded over and over again. If you visit this post you will see some aerial photos showing the devastation that happened in the 40’s around the area. In the end you just have to respect crows and how they know how to party for Halloween. Oh and remember they are all black.